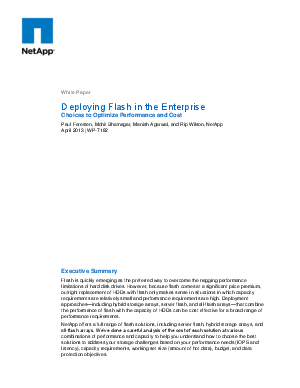 Flash is quickly emerging as the preferred way to overcome the nagging performance limitations of hard disk drives. However, because flash comes at a significant price premium, outright replacement of HDDs with flash only makes sense in situations in which capacity requirements are relatively small and performance requirements are high. Learn how deployment approaches—including hybrid storage arrays, server flash, and all-flash arrays—that combine the performance of flash with the capacity of HDDs can be cost effective for a broad range of performance requirements.